So today is day two in my new job, and I’m having to rethink my shoe wear. Where we lived before, for the last eight years, I was a maximum of one minute away from the bus stop on my way to work. Yes, you read that right, one minute. There were times when I’d hear the bus stop at the bus stop (oh, lol what I did there unintentionally) and I had enough time to grab my bag, kiss everyone goodbye, run down three flights of stairs and still make it for the bus. That, I have discovered today, is no longer the case. We now live exactly eleven fast paced minutes away from the nearest bus stop. Mostly uphill. 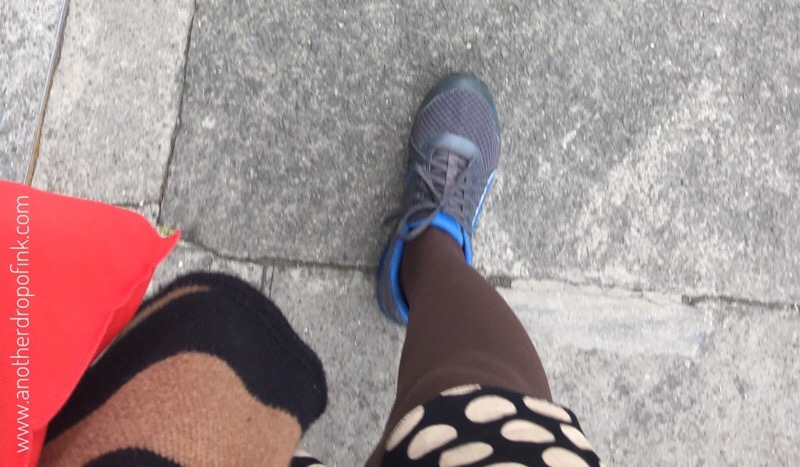 And today I decided to wear my flat shoes instead of the more sensible sneakers (runners or trainers if you’re Irish – why, I don’t know; tackies if you’re Zambian – why, beats me) I had on yesterday. Yesterday I put my heels into a too small bag which I had to cram my lunch, a novel, and an umbrella into, and I have no idea what possessed me to not just switch to a bigger bag today and wear my sneakers. These flat shoes, that I always thought were comfortable, are apparently not so comfortable when you have to walk at a fast pace uphill with a cold. I honestly think my heels would have been more comfortable. Note to self, always wear the sensible walking shoes when walking to work.